Back to School for Pets Too! You are here: Home / Animal Training / Back to School for Pets Too! Each fall we hear about back-to-school for kids but how about for pets? It used to be that kids had extended periods off but now school is in session most of the year with a series of shorter breaks. Because of those changes in the scholastic programming, I seldom see any anxiety cases in companion animals triggered by the absence of their human companions. Even so, many critters are suddenly facing long stretches of time without their human playmates and the occupation their human siblings provide. Both the family and the animals within the household have to adapt to the changes when the kids head off for some educational adventures. To help in the transition, I suggest that you ramp up the exercise, mental stimulation and implement some lesson plans to keep the critters busy. The secret behind this strategy is that you can get a break from both the pets and the kids while also directing any excessive energy into more appropriate behavior. Enroll your pet in local classes such as puppy preschool or kitten kindergarten. Find a professional who offers private or group training sessions and that is a member of the American Pet Dog Trainers Association (APDT). Schedule the time to exercise and play with your pets or hire a professional dog walker or pet sitter to give your creatures some quality attention and activity. Invest in some mental stimulation for your beastly bunch. 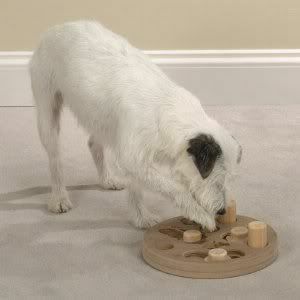 Brain teasers or “enrichment” items really help direct the animal into solving problems. If you need some ideas take a look at some of these dog brain teasers, interactive dog toys, dog puzzle toys and smart cat toys. Schedule some time with your pets while the kids are away. Quality time and attention do wonders to keep an animal manageable. I bet you have some great back to school ideas–why don’t you share them in the comments?